The planet, HAT-P-11b, is categorized as an exo-Neptune — a Neptune-sized planet that orbits the star HAT-P-11. It is located 120 light-years away in the constellation Cygnus. This planet orbits closer to its star than does our Neptune, making one lap roughly every five days. It is a warm world thought to have a rocky core and gaseous atmosphere. Not much else was known about the composition of the planet, or other exo-Neptunes like it, until now. In the new study, astronomers set out to look at the atmosphere of HAT-P-11b, not knowing if its weather would call for clouds. They used Hubble’s Wide Field Camera 3, and a technique called transmission spectroscopy, in which a planet is observed as it crosses in front of its parent star. Starlight filters through the rim of the planet’s atmosphere; if molecules like water vapor are present, they absorb some of the starlight, leaving distinct signatures in the light that reaches our telescopes. Using this strategy, Hubble was able to detect water vapor in HAT-P-11b. But before the team could celebrate clear skies on the exo-Neptune, they had to show that starspots — cooler “freckles” on the face of stars — were not the real sources of water vapor. Cool starspots on the parent star can contain water vapor that might erroneously appear to be from the planet. 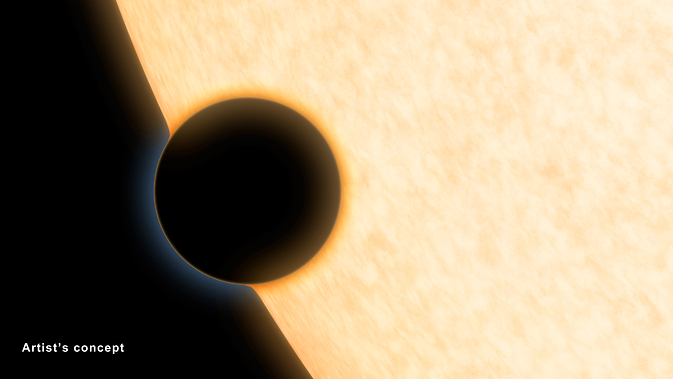 The results from all three telescopes demonstrate that HAT-P-11b is blanketed in water vapor, hydrogen gas and likely other yet-to-be-identified molecules. Theorists will be drawing up new models to explain the planet’s makeup and origins. The astronomers plan to examine more exo-Neptunes in the future, and hope to apply the same method to super-Earths — massive, rocky cousins to our home world with up to 10 times the mass. Although our solar system doesn’t have a super-Earth, NASA’s Kepler mission is finding them in droves around other stars. NASA’s James Webb Space Telescope, scheduled to launch in 2018, will search super-Earths for signs of water vapor and other molecules; however, finding signs of oceans and potentially habitable worlds is likely a ways off. “The work we are doing now is important for future studies of super-Earths and even smaller planets, because we want to be able to pick out in advance the planets with clear atmospheres that will let us detect molecules,” said Knutson.